Welcome to the second installment of Marvel's Night Nurse here on Sequential Crush! If you missed the first issue, check it out here! Hailing from January of 1973, this book has a cover penciled by John Romita and interiors penciled by the astounding Winslow Mortimer and written by Jean Thomas. Now that our three heroines Linda, Christine and Georgia are finished with nursing school, the gripping drama really begins. For these three nurses, issue two really is, as the title states so eloquently, "Night of Tears...Night of Truth!" It all starts with Linda on her way home from her swing shift at Metro General. As she tries to shake the memory of her lost love Marshall, Linda witness a young girl violently struck by a dark green Cadillac and left for dead. Linda, being the calm and professional nurse that she was trained to be, rushes to the girls side and calls out for an ambulance. She clearly impresses the attending police officer, who apologizes for not believing she could handle the situation. She confidently responds, "I just did what's second nature to any nurse." Well put, Night Nurse! As the young victim is brought to the hospital it is discovered that she is Betsy Greeley, the police commissioner's daughter. Her father bursts onto the scene and demands that Betsy be transferred to a private hospital with a private surgeon, Dr. William Sutton. Fortuitously, Dr. Sutton is on Metro General's board and is available to operate. Having been technically off duty, Linda goes home to rest. The story from here on out switches to focus on the flame-haired Christine, who is consequently wooed by Dr. Sutton. The following week Christine begins her work as Dr. Sutton's special assistant, where she is given the job description: keep records of supply requisition, instrument counts and schedules, report information from interns and residents, act as primary scrub nurse, and oh yeah... go on dinner dates with the doctor. You may remember from the first issue that Christine's family was not keen on her becoming a nurse, especially her wealthy father. One Saturday he travels to the city to pay her a visit and threaten her to come home. Mulling things over in a classic romance comic pose (reclined in bed), Christine realizes one of the reasons she may love work so much is because of Dr. Sutton. A close encounter of the doctor-operating-while-intoxicated kind may just change Christine's mind however. Nope! Not quite. Christine continues to go on lavish dinners with Dr. Sutton. She lets him know though that she is aware of the fact that he is writing excessive amounts of prescriptions. Linda is also aware of it, and confronts Christine. Christine distracts Linda by introducing her to Dr. Sutton's handsome new resident, Dr. Jack Tryon. Coincidentally, Jack is missing his prescription pad. Young Dr. Tryon has some insight into the going-ons of how Dr. Sutton's operating room is run. After comparing notes with Linda, the two decide to do a little detective work. Meanwhile, on another date with Dr. Sutton, Christine notices that he is impaired. He drives anyway, and hits a parked car. Hey! Where's Lady Cop when you need her?! The date is cut short when Dr. Sutton receives a radio page from the hospital. Betsy, the hit and run victim has taken a turn for the worse! In response to the tragic news, Dr. Sutton does what any irresponsible, car-hitting, drunk driving, cradle-robbing doctor about to operate on a friend's daughter would do... he hits the booze and downs a handful of pills. Unaware of the Greeley girl's spiraling condition and the events transpiring at the hospital, Linda and Dr. Tryon go to confront Dr. Sutton at his home. Since he is away, they decide to "wait" for him. Snooping through his drawers, they discover that Dr. Sutton is not only stealing drugs from the hospital, but that he was the hit and run driver that struck Betsy Greeley that fateful night! Linda and Dr. Tryon rush to the apartment to tell Christine the revelation of the evening. Before they can break the news the phone rings. For Christine the beginning of the end ensues -- Betsy Greeley has died and an immediate inquest is on the docket. Before Christine can go protect Dr. Sutton, Linda tries to fill her in on the startling discovery. Christine flees in disappointment and disbelief. At the hospital, while the board of trustees wait for the inquest to begin, slimy Sutton tries to convince Christine to lie for him. Christine tries to protect him, but before too long her conscience kicks in and she tells the truth. Phew!!! Dr. Sutton tries to deny everything, but Linda pressures him into telling the whole story of how he not only stole drugs, but how he was the one driving the dark green Cadillac the night Betsy was hit. With the truth on the table and Dr. Sutton in the back of a squad car, Christine disappears into the night. A somber Linda and Jack leave for a long walk, and thus concludes the second issue of Night Nurse! Pretty heavy stuff for a comic book, that's for sure! It's a great story though, don't you agree? The art is amazing, and the pacing perfect. My one complaint though is that save like one panel, Georgia is pretty much absent from this issue. I would have liked to see her more, but don't fear! She will be back in the third issue! 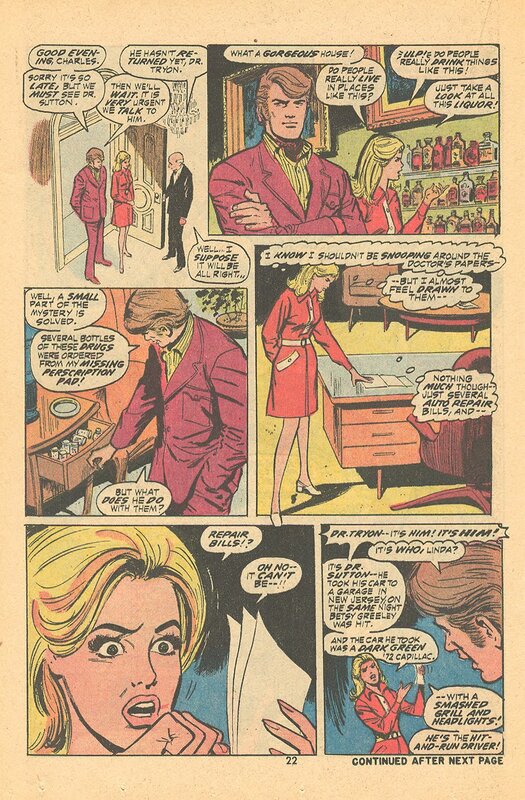 It is also apparent in this issue that a little romance may be on the verge of blooming between Linda and Dr. Tryon. Good thing too!